The console is capable of playing NES, SNES, Sega Genesis, Game Boy Advance and Famicom cartridges of both PAL and NTSC format. The console also supports save states for games of every system. This means that you can save your game at any point in time by accessing the console's main menu. The console also autosaves your progress whenever you shut it down. 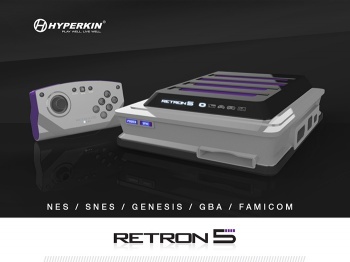 Hyperkin says that the RetroN 5 does a great job of tidying up the sounds and visuals of the games it plays. It supports both standard 4:3 and widescreen 16:9 aspect ratios, and makes use of audio interpolation for a smoother, cleaner audio output. Hyperkin has offered no news of when the new console will launch, or how much it will cost.